SPACE-SAVING FOLDS FLAT - the collapsible folding lap desk is designed that the legs fold in flat, making these trays easy to store and very portable. This allows you to work and take along this desk anywhere and everywhere more comfortably. And holds your house more clean with the option of having it stored in your closet neatly. 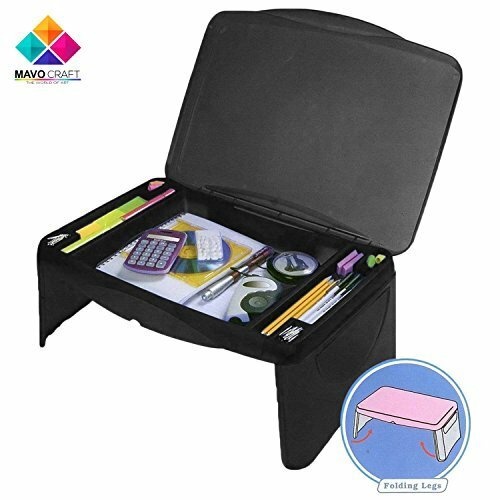 IN USE SIZE: 17.5"L -W 12" H 7.5"
DURABLE HIGH QUALITY - Built to hold all your belongings neat inside the great kids desk with storage up to 7 pounds. It should never break on you.